A day off from other work, so a good day to get back to the Studio. Not as hot and sticky as some recent days. 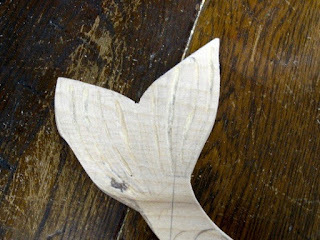 I had finished cutting out the silhouette shape of the mermaid last time, so I started today by cleaning things up a bit. No saw this time- just sandpaper. Plenty more sanding will be needed before this thing is done, but overall it's now less rough and the curves are smoother. This also seemed a good opportunity to redraw the details planned for the surface. No major changes to what had been there from my original sketch, but a few refinements and a lot more clarity. 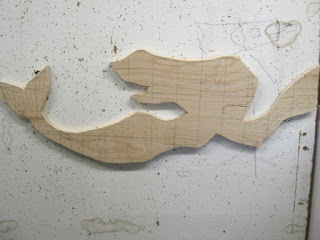 In the mood to continue working on it for a while, I took out my woodcut tools and started cutting the tail. What I had with my was my woodcut class tools, last used in Belmar. Not quite as good as my personal tools, but still useful, though showing some of the wear of those weeks in Belmar. They could use a good sharpening, but the part I was playing with this afternoon did not require a delicate details, so not a problem. Last weekend my brother and his wife held a party in honor of their new daughter, who will eventually be receiving this mermaid sculpture. I used the occasion to show them the progress to that point and ask a few questions. One thing that was settled was the use of color- it was decided that we'd just leave the wood natural, relying on shapes and textures to describe everything. The last week has been mostly occupied with a new job, but I'm off for the weekend and decided to get back into the Studio, this time bringing more tools than last time. That included stopping at a store to by a new saw. since I couldn't find my old keyhole saw and I needed something with a long narrow blade to cut out some of the awkward tight spaces in the design. As demonstrated last time, I could have done the task gradually with a utility knife, but this seemed like it would be a lot faster. And it was. In less than an hour I had removed the chunk of wood above the arms and to the left of the starfish, completing my mermaid silhouette. The rest of this process will be done with sandpaper and my woodcut gouges. Had a little time this afternoon, so I decided to go up to the Studio and continue on my mermaid piece. One problem- lack of tools. Should have brought a lot more with me than I had. I thought I had at least one of my C clamps with me, but it turned out I didn't. Hadn't brought any of my woodcut tools with me, thinking I wouldn't need them yet, but they would have come in handy. My drill would have let me make more progress, but that was also back home. 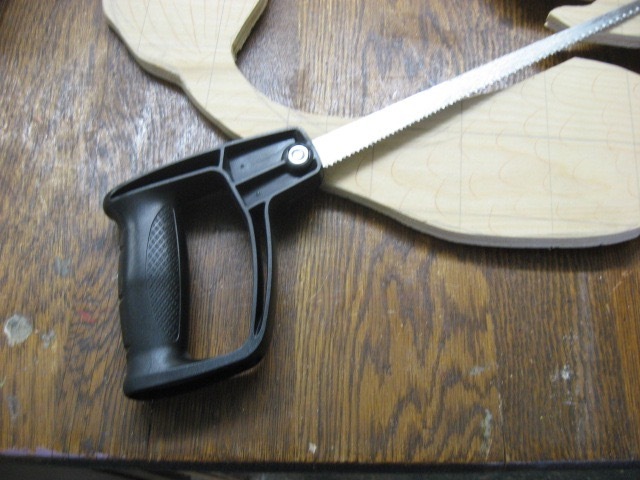 My coping saw does a fine job of cutting, but the design of the figure wouldn't let me use it for everything- the saw frame got in the way of some cuts I wanted to make. Then there was the weather. Our week of hot humid weather continued. I could handle the temperature, but I guess we've reached the time of year where the dampness in the basement can be oppressive. My shirt was getting soaked with sweat, so I decided it was time to give up and go home. 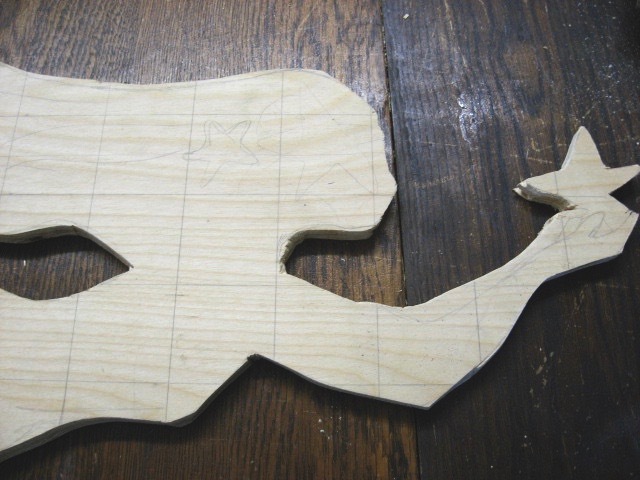 I had used the saw all the places I could reach, and had improved some of the areas around the hands and starfish. Later I was back home and had access to my woodcut tools, and was able to remove that piece in the upper left quadrant of the star. After all, this is the same kind of wood I use in my blocks these days, and for my recent class, so this is within my capabilities. Results can be seen below. A lot of work remains, but I'm making progress and I have the skills and tools to do it, as long as I remember to bring them with me. The news says that the weather may cool down in a few days. Another day when my training session ended relatively early and I was home with a few hours left in the afternoon. Also another day with high 90's temperatures and extreme humidity. 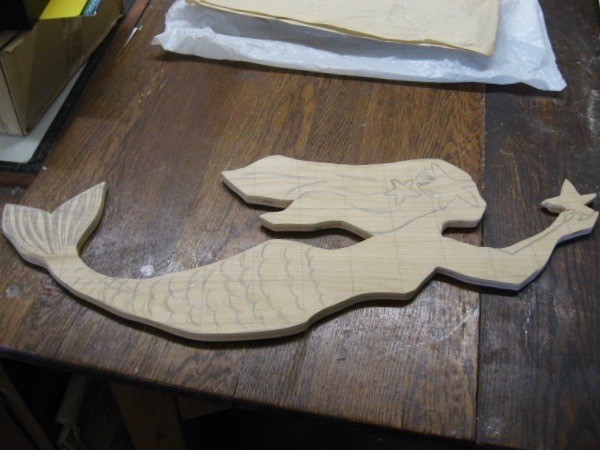 So why not another day going to the Studio to do some work on the mermaid? Besides picking up the piece of wood, while I was home I grabbed my drill and a bunch more wood shaping tools. 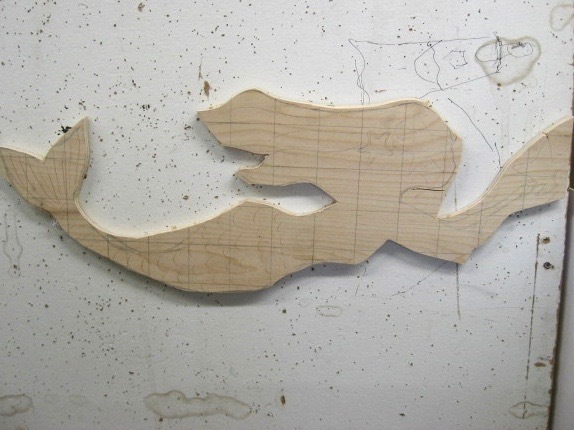 Only worked for about a half hour today, but in that time I cut out the area below her chin, better defined the shape of the face, and gave the tail a more definite shape. It was enough for me to confirm that I had the tools and ability to finish this piece, though today I stopped after 30 minutes because of the heat and exhaustion following four days of training. Predictions are for more of the same weather tomorrow, and if so I'll skip the Studio visit. I have some more questions to ask anyway. But I'm confident this will get done. 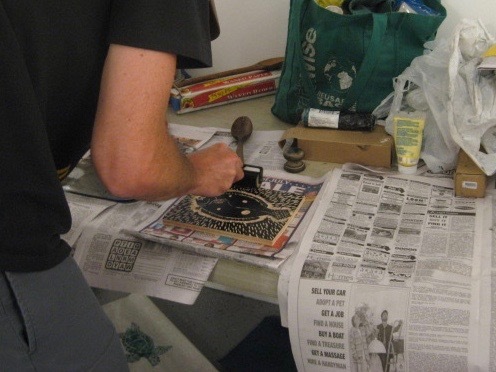 About a week ago we had the last meeting of my summer woodcut class in Belmar. That was after we had skipped a week for Independence Day, and one of my students asked me if I had done any new prints since our previous meeting. No, as all my spare time was taken up by class preparations and seeking a new summer job. I have spent the past two weeks attending trainings for that job. But those end this week, the class is over, so it's time to get thinking about the next project. I don't have another print in the works quite yet, but I do have a project going. Back in the spring my brother and his wife requested something beyond just the usual saint print, which I completed a few weeks ago. What they want is a relief sculpture of a mermaid, which will eventually hang in the bedroom of their new daughter. Well, relief is my specialty. Karen gave me a sample image, which I redrew onto a piece of birch plywood, and set aside. Have some time now, so I may as well get going on it. 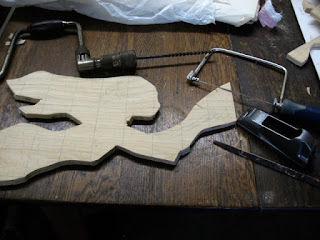 Today was the next step, using a sabre saw to start cutting out the rough shape of the figure. Results are below. Using the electric saw could only get a rough cut at this point. 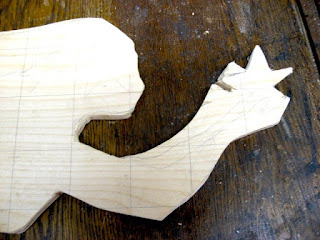 For the detail areas around the face and hands I'll need to cut with my coping saw and other more delicate tools. 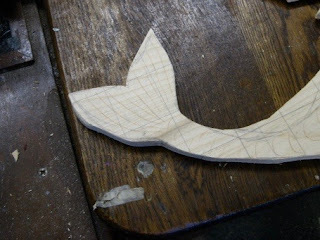 And when the shape is finished, I can use my gouges to give form and depth to the body. I don't know if they have a plan for the surface or not- natural wood, hand coloring, etc. 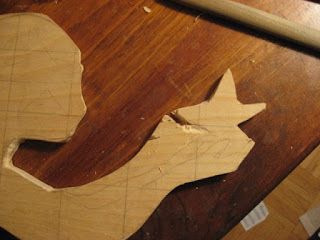 But I need to get the cutting and carving done before I worry about any of that. A very busy week so far. Just had an intense trip to NYC, and had a bunch of stuff to do with watching my parents' house while they were away, and my new job finally began this week with a daily series of trainings, plus tonight was my last scheduled meeting of my summer woodcut class in Belmar. Could I pull it all off? The trainings are all in Hamilton, NJ, which (for those who are not from this area) is literally on the other side of the state from everything else mentioned above. Luckily today is the shortest training day by schedule, so I was home around 4:30- plenty of time to get to the next stop. I had started loading stuff last night, so I only had few things to take to the car this afternoon. The building was kind of crowded today, with a big meeting going on when I arrived, and later a writer's group meeting as well. And all 6 of my students were there, and all ready to work. 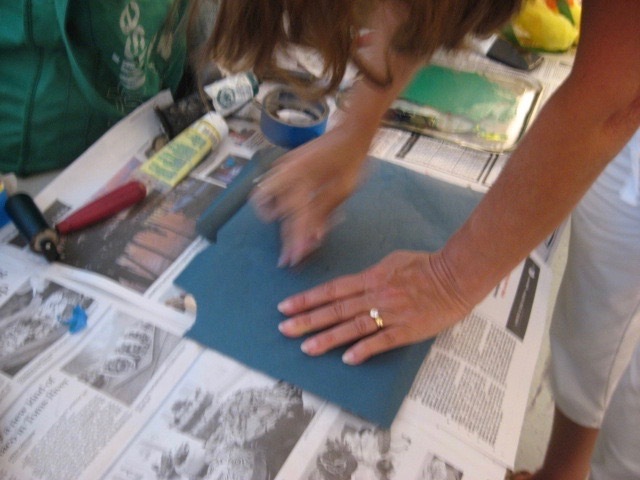 Marisa, the one student who wasn't ready to print last time was anxious to check out how her turtle block had come out. In previous meetings I had talked about the possibilities of colored papers and inks, and she jumped at that opportunity. 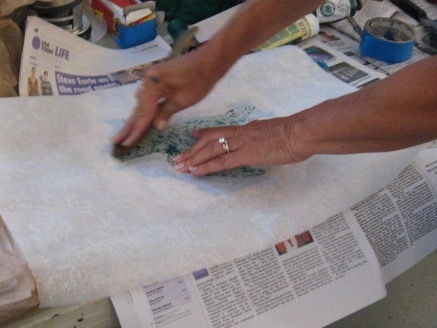 First she tried straight green ink on a deep blue paper (above), then lightened the ink a little with some yellow and printed it on a white Japanese paper. (below, where the ink can be seen through the thin paper) The class enjoyed her complex design, and she seemed satisfied with the results, especially when I pointed out colors could be seen through the Japanese paper. Dave and Megan both chose to go with black oil ink, but tried a variety of papers. 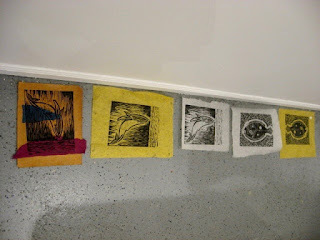 Below are some examples of his fluke print, and her whale prints, including one chin colle color piece. There were other things I didn't get a chance to take photos of. In some ways the evening reminded me of the last night of the Print Blitz I went to down in Texas- with all the high school students working deep into the night to take advantage of their last night in the studio. My students were all older, but no less interested in prints. Jill reclaimed the piece she left behind last week and cleaned it up before printing it in multiple colors. Donna completed and printed a second cat print, on multiple types of paper. And Patrick cranked out a small print. 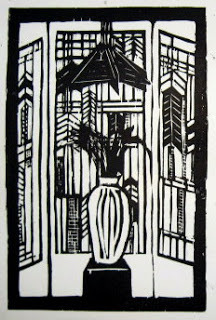 Some have expressed an interest in continuing with woodcuts. Don't know exactly what the future holds, but it won't be next week. Glad this was a success. Yesterday I took a trip up to NYC to hang out with an old friend and to see some art. Was so tired when I got home that I just collapsed, so I'm writing this today. My friend was Doug, who I first met when he was part of the group I used to sit with in Calculus class, my first semester in college, so he and I go back to even before the Italian House girls I saw recently. We also had a class together my last semester at W&M, an anthropology class, but in between he had connections to other friends of mine, so I'd see him now and then. He was much better at math than I was, eventually earning his Master's and Phd, and currently a full time math professor down in South Carolina. Shortly after that first class we had together I declared an art major and took a different path. If we ever have occasion to be in the same part of the world we get together and share stories of our fellow Tribe students and the highs and lows of being college professors. He was staying at a hotel in the city, a little vacation, and invited me to join him for a museum visit. One of the options he gave me was a Frank Lloyd Wright show at the Modern. I'm no architect, but I have long been a Wright fan (see my last post on July 4th) and chose that one. Usually I take the train up from the shore, and there was the complication. There have been a slew of NJ Transit train derailments this year, including my very train in Penn Station, just a few days ago. But they said it was running, so I took a chance. There were some slowdowns as we approached the Hudson, but the train stayed on the tracks- so a success. Walked the mile and a half to the museum, met him out front, and we had a delightful day of looking at art. This show was mostly a collection of drawings from Wright's studio. In my opinion he's best appreciated standing within one of his buildings, but they weren't going to move a whole house to the museum. The drawings did demonstrate his design skills- if he never built a building I think he could have made it as a 2D artist. But fun was over, and Doug kept me company on the walk back to Penn, and then I spent a half hour in the rabbit warren that is Penn Station before catching my train south, which once again stayed on the tracks. (next week begins what the news is calling the "summer of hell" which will involve all kinds of train closings and rerouting while they hope to repair all the problems they've been having, so this may my last train trip into the city for a while). I don't think it's possible for me to not notice the Fourth of July. It's a national holiday, which gives countless businesses an excuse to close for a vacation. The area I live in quickly becomes overwhelmed with tourists, all choosing the worst time of year to come for a visit. This past week I saw a lot of people hiking up the hill into Ocean Grove, wearing backpacks and/or clutching suitcases, likely arriving from the nearby Asbury Park train station. Driving or parking in the shore towns becomes a major challenge. Many nights I can hear fireworks, since almost every town holds their own display in the week around Independence Day. (if some conflict keeps you away from your local show, there's always a bunch more to pick from). There's usually a Twilight Zone marathon on tv. (lately the cable stations bring me at least one episode every day, so it's not my one chance to watch it, but the marathons always concentrate on the favorites, so there will be some worth watching) An excuse for television stations to show movies with colonial themes- I'll catch at least part of 1776 tonight. And then there's the matter of my Fourth Of July woodcut series. Completed in 1994, but probably my signature art piece. A simple concept- a woodcut for each day for a year, each based on the day of the year it is about. The 366 print set covers July 4, 1993 to July 4, 1994. Those who have never seen the original prints can see the whole set online (including the story behind each) on my Fourth of July blog. The complete year has been shown 4 times (the blog includes a photo of the most recent such display) and individual prints continue to appear in juried shows. For instance, almost any theme one can imagine is covered in at least one of those 366 prints. (the one problem is that half the blocks were destroyed by Hurricane Sandy, so those days are not reprintable and out of circulation) It has become a teaching tool whenever I am teaching woodcut- I bring in my bound photocopy version to show the wide variety of mark making and design strategies that I employed in making 366 woodcut prints in a year. I'll be using it in Belmar this month. Because it is essentially a diary, I can use it as personal research into my own life. For example, later this week I have plans to meet with an old college buddy from the 80's and see a museum show, and one option he gave me was a Frank Lloyd Wright show at the Modern. That caused me to think about the one Wright building I have seen in person (architecture is best experienced in three dimensions in person- not in a book), going back to my grad school days. But which one was it again? Went to the blog and found the answer- the Dana Thomas house in Springfield. Impressive enough to be the subject of my print that November day. Had no photos to look at, and the internet was just getting started, so I just went with my memories and impressions. Maybe I'll learn more in NYC.